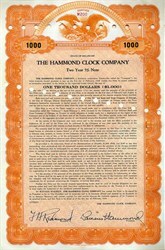 Beautifully engraved certificate from the Hammond Clock Company Bond issued in 1936. This historic document was printed by the Columbian Banknote Company and has an ornate border around it with a vignette of an eagle and the company name. This item has the signatures of the Company’s President, Laurens Hammond and Secretary, J. H Redmond and is over 81 years old. Punched cancelled, but no cancellations through signatures. This is the first time we have had this for sale and believe it to be quite scarce. Initially, business was booming for Hammond, but the Great Depression soon changed that. Searching for new uses for his synchronous motor, Hammond hit upon the electric organ as a potentially suitable instrument for his motor, and testing of the first prototype of the Hammond organ began in 1933. He won patent approval soon after, on 24 April 1934. The first order for the Hammond Organ came almost immediately from engineers working for Henry Ford, who had been charged with the task of looking into the manufacture of electric organs for the famous industrialist. On 7 February 1934, Ford purchased six organs. Hammond changed the name of his company to the Hammond Instrument Company in 1937 to reflect the importance of this new invention. Hammond later developed the less expensive chord organ in 1950, designed for people who had never used a keyboard before, opening up a vast market. In 1953, the Hammond Instrument Company became the Hammond Organ Company, further demonstrating the predominance of the sales of Hammond’s organs rather than the electric clock he invented earlier. After retiring in 1960, Hammond spent the remainder of his life in his many homes, both in the United States and abroad. 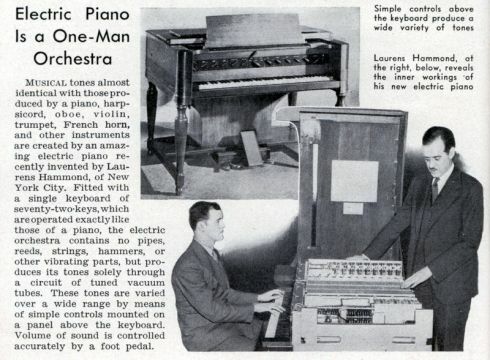 Laurens Hammond (January 11, 1895–July 3, 1973), was an engineer and inventor of the Hammond organ.